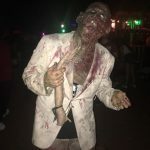 Scream Hollow Wicked Halloween Park is a Haunted Attraction located in Smithville, TX. 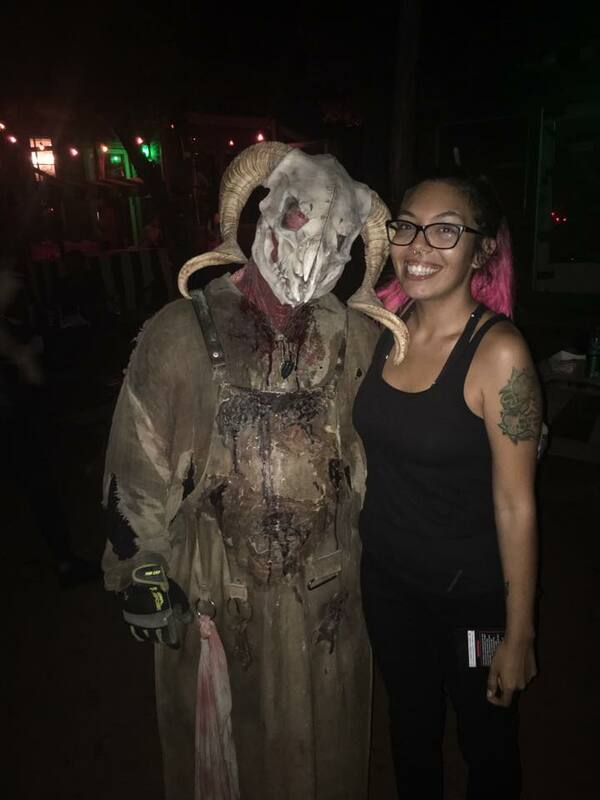 Team Lollipop Massacre reviewed this Haunted Attraction on October 6, 2018. 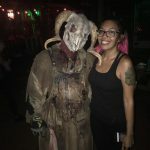 We visited Scream Hollow (SH) on a busy Saturday night and management informed us that they only had about 48 actors on location at the time. We only saw about fifteen or so of these actors. That means, even though they have all of these amazing scenes, there were a lot of dead spaces throughout each haunt. We would have really loved to see those spots get used to their full potential, as a lot of the actors were screamers or growlers. Although, there were a few actors who really pulled their weight and kept on their toes as we made our way throughout the haunts. There were only a few iconic characters out in the queue lines when we arrived, only one of which I had ever seen before. It seemed to be one for each haunt, but not all of them were as interactive as we had originally hoped. When we finished with all four haunts, there was only one character still out entertaining the line. They did have a really amazing Jason Voorhees walking around through the crowds; he was one of our favorites. He looked just like the real Jason! Inside the haunts, there was one specific character that we saw whom you should keep an eye out for; he was called The Doktor. Never breaking character and using all of his props around him, he was loud and clear on his scary message. You will be very glad you didn’t miss that one. The cast and crew did a great job for being as sparse as they were. 20 acres and 4 haunted houses is a lot to manage, but they did their best and were very entertaining. The costuming and makeup was on point! They did a great job with making their actors fit in with their scenes properly. Some of the most memorable looks include the rednecks with giant knives, covered in blood, chasing us and yelling about how we looked so tasty and the screaming, bloody victims praying for help. The zombies were disgusting and had just the right amount of “Oh, you’re dead,” feeling to them. My favorites were the ghost children of the Mansion. They were creepy, realistic-looking ghosts, but making them children was perfect for a good scare! The haunt’s makeup artist was fantastic on getting everyone ready for their scenes. There were a couple of masks out there that could have used some darkened eyes, but other than that, they knew exactly what they were doing with costumes and makeup. GPS takes you directly to SH with no issues, except once you get out on 304, it gets pretty hard to guess which turn is yours. It is incredibly dark as it is way out in the country. Thankfully, they have giant spotlight in the sky to help guide you. Once you turn onto Split Rail, it’s not hard to find. There’s a giant “Scream Hollow” sign after you turn onto the road. The parking lot attendants are good at directing the traffic and very polite as well. The parking lot is dirt though, so keep that in mind when you come to visit. There is plenty of staff walking around, available to answer any questions you might have. The common area is a safe zone, so not too many super-scary things go on out there. Also, keep in mind that they do not have permanent restrooms yet. They only have port-a-potties, but they do have a lot of them, so the lines usually aren’t very long. This is an indoor/outdoor style haunt. As with most outdoor haunts, there will be some “trip hazards”. Please be careful when going through the haunts, as the ground is uneven; there are a lot of roots and tree stumps to trip on. They have a few things that you could get hurt on; some of the fencing is leaning and there are holes in the ground and in some of the floors throughout the Mansion. Make sure to walk slowly and wear close-toed shoes. They do not have covered lines, so dress appropriately for the weather. The staff are professional and so incredibly friendly. It’s almost like walking into a house full of truly strange relatives that just want you to have a good time. Everyone is all smiles and laughs. If you have any questions, someone near you will likely have the answer. They take great pride in their work and all of the information on SH is easily available on Facebook and their website – everything from directions and ticket pricing to all of the fun extras they’ve got on-site. When you pull into the parking lot, you know you’re at a haunted house. However, the drive there really makes it feel more like a horror movie. It gives you the feeling that you don’t really know if you’ll come back out once you enter. There wasn’t a lot of audio throughout the haunts, so it was oddly quiet during our tour. They did have some air blasts and firecrackers that went off and those gave us a good jump startle. There were lots of movie-quality props and animatronics though, which were all great and scary. The scenes were all well designed and very nice to look at, making our tour a lot of fun and a bit interactive. All four haunts have different themes that are well-played. Each has a different story that goes along with the atmosphere and location. Vigil’s Last Laff is full of cannibalistic rednecks. Gore, blood, and one very specific shotgun scene will mess with your mind while going through. Mansion of Terror has demons and possessed children of an orphanage that used to be there. Now full of randomly-moving objects and lights going on and off, it’s good for that typical “haunted house” vibe. Zombie City has a real gas station and tons of zombies coming to eat your brains. The hospital where the virus broke out is still standing, but when you meet The Doktor, you’ll be wondering if it was accidental or on purpose. If you don’t go through quickly, you might just become one of them too. The zombies, cannibalistic rednecks, demons, and possessed children ghosts all went well together out in the middle of the woods. They executed each theme beautifully and each one seemed to be thoroughly thought-out. 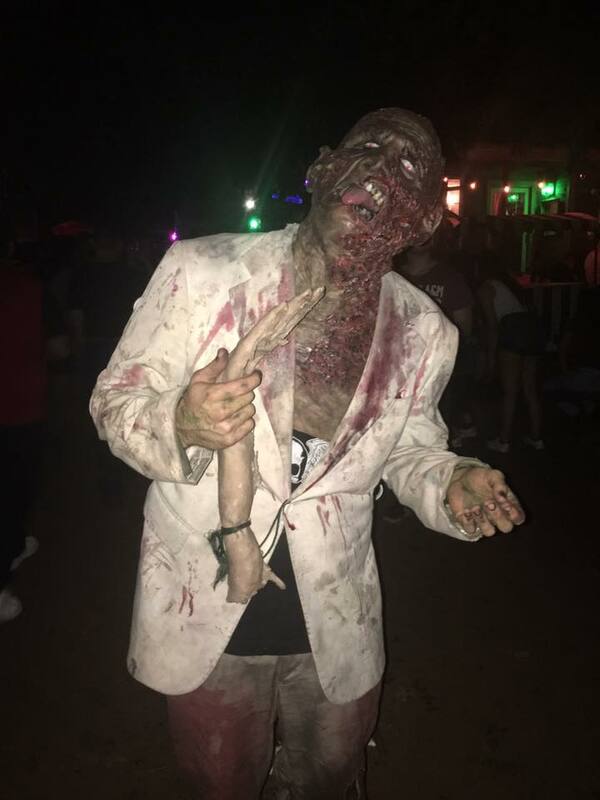 They have full potential to be the scariest haunt, but due to their lack of actors when we went through, it wasn’t as scary as it could have been. They had some good jump scares, some amazing props and animatronics, but a lot of the actors they did have weren’t ready when we came through. Typically, whoever was in front or in back were the main targets of all the scares. They would pop up and scream, but then just back down and disappear. 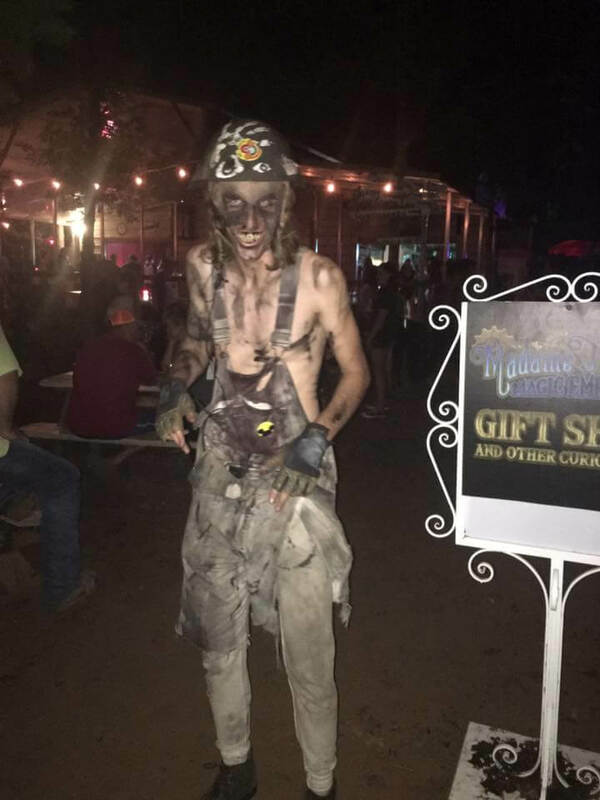 The rednecks were probably the scariest, due to the fact that a couple of them would actually banter back and forth with us but also, they had no filters, so the things they were saying were incredibly entertaining. My personal favorite throughout the haunts was The Doktor in Zombie City. He hopped up on the gurney and was screaming at us and he knew our names so it made it much more fun and interactive. Don’t forget to tell him “Hello” when you go through! Although there just weren’t enough actors when we went through to really make it scary, they did have a few dedicated enough to come from everywhere. Above you, below you, the sides, who knows! They put on one great show. Even if haunted houses really aren’t your thing, SH provides so many more things than just that for entertainment. They’ve got a gift shop, a café, a bakery, a bar, funnel cakes, Tarot readings, horror movies playing on a big screen, and live music. 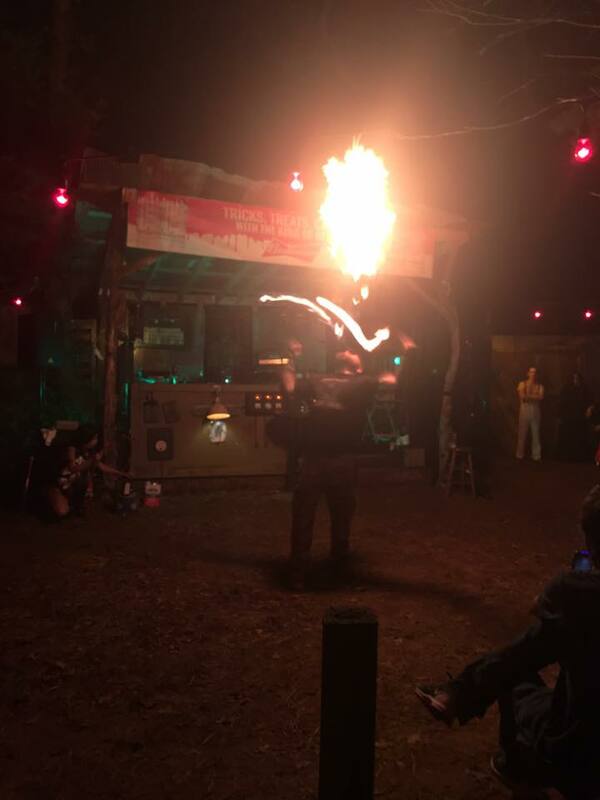 All of this is set up around a giant bonfire along with fire spinners and a dance floor if you’re feeling like getting down. There is fun for the whole family here. The drive out to Scream Hollow is long and anxiety-inducing, so by the time you pull in, your nerves are already on a high alert. 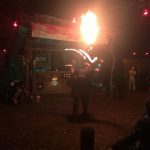 They also provide camping if you feel up to a super scary challenge! Kenneth McAda runs the Cackling Witch café and bakery. When you visit, make sure you come hungry. The brisket is to die for, but they sell out quickly. Thankfully, they’ve got pizza, and he is a pizza master! You will not be disappointed with the food! 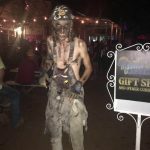 Scream Hollow is well worth the drive and ticket price because there is so much to do while you’re there. You can easily spend your entire evening there without ever having to leave because you’re bored. With the food, music, movies, gift shop, and bar, it’s a one-stop shop for all your Halloween fun. Four haunts, twenty acres, and they are using it wisely.